Dover, NH – The Children’s Museum of New Hampshire is once again offering a Military Appreciation summer program. From Saturday, May 26 through Sunday, September 2 current and retired military personnel and their immediate family members receive free admission through the Blue Star Museums program. Simply show a military ID at the front desk to take part in the program. This program is supported by People’s United Bank and BAE Systems. With the start of summer comes warmer weather, and the Dover Adventure Playground offers the perfect excuse to make an entire day of your visit to the museum. The playground features a life-size flat-bottomed gundalow boat, a net climber, swings and slides, a 3-story Garrison tower, a splash pad, musical instruments, and a climbable granite Alewife fish sculpture (named Henrietta by the public last summer). The playground is open 7am-9:30pm daily and is free. Did you know the museum hosts birthday parties? For the months of July & August book ANY party package and receive 10% off. This includes the museum’s new themed Blowout Parties, which include everything you need to make your child’s party a hit including decorations, paper goods, a game, a personalized quarter sheet cake, ice cream cups, juice boxes and water for the kids, and of course time to play in the museum! Visit www.childrens-museum.orgfor more information or call the museum to book a party: 603-742-2002. Join us at the 6th annual New Hampshire Maker & Food Festival (formerly the Dover Mini Maker Faire), an all ages celebration of creativity and innovation taking place in and around the Children’s Museum of New Hampshire in downtown Dover, NH on Saturday, August 25 from 10am-4pm. Whether you are an engineer, a scientist, a tinkerer or an artisan, we want to see what you do! Sign up to be a Maker presenter, performer, sponsor, to give a workshop, or sell your creations. Purchase early bird tickets to the NH Maker & Food Fest June 1st – July 31st: Kids ages 5 and under are Free. Members ages 6-adult: $5/person, Non-members ages 6-Adult: $8/person. Or purchase an Advance Family Fun Pack, on sale June 1st – August 24 at noon: $35 for two adults and up to 3 children (ages 6-17). Tickets at the door are $12/person ages 6-adult for Non-members; $6 for Members ages 6-adult. Visit www.childrens-museum.org to learn more or to register. Thank you to all our NH Maker & Food Fest sponsors including The Unique College Investing Plan managed by Fidelity Investments, Martel Plumbing & Heating, The Rowley Agency, Inc., and Alexander Technology Group. The Children’s Museum of New Hampshire is the organizer of the New Hampshire Maker & Food Fest (formerly the Dover Mini Maker Faire). This Festival celebrates the diverse innovators and creative thinkers in our communities who push boundaries and passionately explore new ideas. The museum invites individuals, groups, schools, teams, and businesses to create a sculpture, working machine, interactive game or anything else you can dream up, using only cardboard. All creations will be displayed at the 6th annual New Hampshire Maker & Food Fest on Saturday, August 25, 2018. It’s easy and free to sign up to participate in the Cardboard Challenge, and it’s a great way to work on a collaborative project this spring and summer. Visit www.childrens-museum.org to learn more or to sign up. Visit anytime after 3pm until 7pm on the first Friday of each month during the school year and enjoy the museum for only $3 per person! The $3 admission represents a 70% savings over regular admission, and offers families a fun opportunity for creative play before bedtime. Library passes and other discounts do not apply during this event. The museum is part of the free Dover Art Walk. Please note, however that the museum closes at 7pm while the Art Walk goes till 8pm. This will be the last First Friday $3 After 3pm program of the school year. The program will be back in October, 2018. Visit www.childrens-museum.org for more info. Drop into the STEAM Innovation Lab today during our “First Friday $3 After 3pm” program for Camp Day! Staff will be available to answer questions about our summer camps and kids can try some camping themed crafts, games, and activities! Make a “mini s’more” in our solar oven (pending weather! ), listen to a camp fire story around our indoor “camp fire,” and get excited for outdoor fun this summer! We’re open until 7pm tonight and admission for everyone is only $3 after 3pm! Camp fun is all included with museum admission. Visit www.childrens-museum.org for more info. On the first Sunday of each month during the school year, families with children on the autism spectrum are invited to the museum for a free visit. Today we’ll welcome Drs. Randi Jo and Marc Steiner who believes that chiropractic helps your brain communicate better with your body. They will be able to answer questions about how chiropractic treatment may be beneficial for children with an Autism Spectrum Disorder. Also visiting today is a representative from the Center for Autism Related Disorders (CARD) who will be available to answer questions about Applied Behavior Analysis (ABA) and other services CARD offers. Exploring Our Way provides opportunities to enjoy family time at the museum in a safe, understanding environment, allows parents to network with one another, and will help families discover new resources. Exploring Our Way guests are welcome to stay and play when the museum opens to the public at noon. Children must be accompanied by an adult and siblings are welcome. Exploring Our Way is generously supported by H.O.P.E. Behavioral Consulting, Kennebunk Savings Bank, Eversource, and the Finlay Foundation. This program is free. Visit www.childrens-museum.org for more information. Exploring Our Way doesn’t take place over the summer. See you on Sunday, October 7 when the program resumes! For the 3rd year, the Children’s Museum of NH is participating in the annual NH Gives program, an initiative of the NH Center of Nonprofits. This event is designed to bring the state together as one community, raising as much money and awareness as possible for NH’s non-profits within a 24-hour flood of donations. The museum’s goal is to raise $2,000. Donations made will be used to support the families who might struggle to pay museum admission fees. Over 30% of visitors are only able to visit because of the “Museum Access for All” program, which does things like provide subsidized bus visits for Title 1 Schools, allows families using EBT cards to pay just $1 per person admission, and even offers free programs for families with children on the autism spectrum. If the museum reaches its goal, CMNH president Jane Bard will lead the staff on a parade through the Dover Adventure Playground’s splash pad in celebration! Visit https://www.nhgives.org/organizations/cmnh to donate during NH Gives, or visit www.childrens-museum.org to learn more. Wee Ones Wednesdays is an interactive weekly drop-in program for children ages 2-4 and has been designed as PRE pre-school. Children and a parent or caregiver enjoy art, music, movement and conceptual learning with a new theme each week. Sessions are offered from 9:45-10:30am and 10:45-11:30am. June 13th is the last Wee Ones program of the school year. Wee Ones will be back in the Fall starting September 19. The cost per adult/child pair is $7 for Museum members and $10 for Non-members. Additional children in a family are $5 each for Members and $8 each for Non-members. We also offer a punch card option for Members who attend regularly: a 5-class punch card is $30 or 2 cards for $55. Visit www.childrens-museum.org for more information. The First Friends Playgroup for children ages 6 months to two years is a drop-in opportunity for parents and babies/toddlers to play together in the Early Learning Landscape area. Join Early Childhood and Literacy Coordinator Meredith Lamothe, MLIS, for Playgroup and Baby "Lap Sit" Storytime at 9:45am. Learn important early literacy skills to practice with little ones and enjoy some rhymes, puppets, songs and stories. June 13th is the last First Friends program of the school year. First Friends will be back in the Fall starting September 19. This program is free for museum members and regular admission applies for non-members: $10 for adults and children, $9 for seniors and no charge for babies under 12 months old. 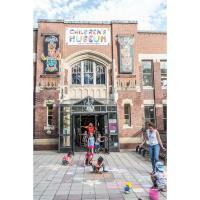 Visit www.childrens-museum.org for more information. Help us plant vegetables and herbs in our new museum gardens, located in the Dover Adventure Playground and sample some yummy veggies already growing. Free with museum admission. Visit www.childrens-museum.org for more information. 35 Friends: 35 Years of Art & Creativity! Did you know that the Children’s Museum of New Hampshire was founded 35 years ago? 35 years means we’ve enjoyed seeing a lot of great art, not only created by our visitors, but also by professional artists who have generously shown their work here! Gallery 6 is celebrating the museum’s long history of creative collaboration with a special summer exhibition and raffle. 35 artists from around New England, who have helped inspire and shape the museum with their creativity, have donated works of art that will be on view all summer. And it gets better! You can buy raffle tickets to bid on your favorite work of art the next time you visit. A sheet of 25 raffle tickets only costs $5, or you can get 5 sheets for $20. As you go around with your kids to pick your favorites, it’s a great opportunity to not only take a stroll down memory lane, but to also talk about art! Then on Saturday, September 29th we’ll auction off some of the works of art at a live auction event. You don’t have to be present at the live auction to win. Raffle tickets can only be purchased at the front desk of the museum. Visit www.childrens-museum.org to learn more. Gallery 6 is supported by the New Hampshire State Council on the Arts, Georgia-Pacific, and the Fuller Foundation. In honor of Father's Day, all fathers and grandfathers are granted free admission for their visit today! Kids can make festive crowns and picture frames for the special man in their lives. This gift-making activity is included in paid admission and FREE for members. Visit www.childrens-museum.org for more info. Today is the start of our summer hours. The museum is open Mondays through Saturdays, 10am-5pm, and Sundays, noon-5pm. These summer hours are through the day before Labor Day. Visit www.childrens-museum.org to learn more. People living with Alzheimer's disease are welcomed on the third Thursday of each month during Alzheimer’s Cafe, along with their family members and care partners, to gather in a supportive, non-clinical setting to chat, relax and socialize while enjoying complimentary refreshments. This month we’ll be learning about the benefits of practicing Tai Chi. Reservations are not needed and there is no cost to attend, though donations are accepted. Visit www.childrens-museum.orgfor more information. Alzheimer’s Café is sponsored by Abbie Moseley Trust, LTC Partners, and Wentworth Senior Living. Kids shouldn’t have all the summer fun! Kick-off summer the right way with an evening of grown-up fun at the Children’s Museum of NH! Indulge in snow cones, decorate your own neon sun visor, make a sandcastle sculpture to bring home, play games, and more! As always, 7th Settlement Brewery will serve beer, wine and a signature cocktail (cash bar) and the museum will dish out the fun as well as non-alcoholic beverages. Where else can you and your friends enjoy a cash bar, refreshments and a chance to leave an impression in a giant pin screen, or play a tune on a wall-to-wall Music Matrix? Advance online tickets are $10 and will be $12 at the door. Grown-ups only please (21+) and ID is required. Buy your tickets online at www.childrens-museum.org. These special workshops are for kids ages 6-11, and are based on some of our most popular school group lessons! Kids can enjoy a 45-minute lesson led by a museum educator, followed by free time to explore the museum with parents. Today’s River Builders workshop will lead kids in discovering the many creatures that build along and within the river. Students will learn about the variety of materials used to build these creations, and how the river ecosystem supports these unique builders. Workshops are $8 per child and families get in at a discounted rate of $6 per person (for Non-members; Members get in free) to explore the museum during the lesson. Please note that anyone who stays for free time in the museum must be supervised by a grown-up. Pre-registration is required and sign-ups are on a first come, first served basis. Learn more or register online at www.childrens-museum.org. Campers ages 4-6 will enjoy some of our favorite aspects of our popular weekly PRE pre-k program - Wee Ones! Enjoy singing, movement, circle time and hands-on activities. We will also explore music, art and animal science. Cost is $90 for Members & $100 for Non-members. Go online, www.childrens-museum.org, to learn more or to register. Please note that registration will close one week before each class begins. The Children’s Museum of New Hampshire offers 3-day summer camps for mini-campers ages 4-6, and 4-day summer camps for kids ages 7-11 with varying topics and themes. The 3-day Mini Camps for ages 4-6 run Tuesdays through Thursdays from 9:15am-noon and cost $90 for Museum Members and $100 for Non-members. The 4-day Discovery Camps for ages 7-11 run Mondays through Thursdays from 9:15am-1pm and cost $150 for Museum Members and $170 for Non-members. 2018 3-Day Mini Camps: Wee Ones Summer Edition (June 26-28), Incredible Animals (July 24-26), Yes, You are an Artist! (August 7-9), Storybook STEAM (August 14-16), and Junior Science: Science Art (August 21-23). 2018 4-Day Discovery Camps: Chasing Dinosaurs (July 23-26), STEAM Science and Art (August 6-9), and Tinkerers, Makers, and Engineers (August 13-16). Registration is required. Learn more or register at www.childrens-museum.org. Please note that registration will close one week before each camp begins. These special workshops are for kids ages 6-11, and are based on some of our most popular school group lessons! Kids can enjoy a 45-minute lesson led by a museum educator, followed by free time to explore the museum. Today’s Physics of Flight will lead kids in exploring flying objects and discovering what makes them work. Kids will learn about items from nature that fly and relate them to flying machines. Each student will engineer and create their own flying object to test and re-test in the Build It, Fly It exhibit Workshops are $8 per child and families get in at a discounted rate of $6 per person (for Non-members; Members get in free) to explore the museum during the lesson. Please note that anyone who stays for free time in the museum must be supervised by a grown-up. Pre-registration is required and sign-ups are on a first come, first served basis. Learn more or register online at www.childrens-museum.org. Do you have a little one heading to Kindergarten this fall? Kindergarten Club aims to help prepare, excite, and calm children heading into a Kindergarten classroom for the first time – from the comfort of the museum! We will explore and reinforce common classroom manners (sitting on a rug, walking in a line, raising hands), create crafts, play games, sing songs, read stories, and more! There will be no club on Friday, August 3 (come to our Teddy Bear Clinic instead)! Cost is $120 for members, $140 for non-members. To learn more or to register visit www.childrens-museum.org. Please note that registration closes one week before the club begins. June in the Muse Studio: All About Water! Drop-in to explore activities, crafts, and games about water! Explore everything from lakes to oceans to adorable water-dwelling creatures! Free with Museum admission. To learn more, visit www.childrens-museum.org. This month in the STEAM Lab we are getting excited for summer and exploring activities and experiments that can be done outside! Make a parachute to try in the park, create your own water slide, and learn about New Hampshire animals throughout the month. STEAM Lab activities are free with museum admission. Check the online calendar for daily topics and times, www.childrens-museum.org.The STEAM Lab is generously supported by Granite State Development Corporation.